1. Brown hamburger and drain. 3. In a Glass 9 Inch x 13 Dish , press out crescent rolls and roll them to form crust. 4. Here comes the Dairy!!! Layer hamburger mixture, sour cream and then cheese. 5. 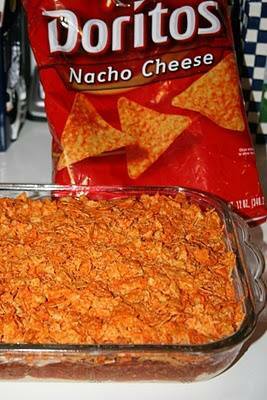 Crush about 3/4 of a bag of Doritos and put them on top. Bake at 350 for 30 min.